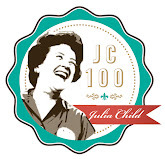 I'm a cultural Jew: I don't keep kosher, or Shabbat, or go to synagogue. But I like Jewish traditions and culture, and of course Jewish food. One of my favorites is a matzo ball soup. I always use a boxed mix and add a few extra ingredients to give it my own spin. Follow directions on the box, but add 1/4 cup dill to the matzo ball mix. Add peas and carrots during the last 5 minutes of the cooking process. Enjoy! 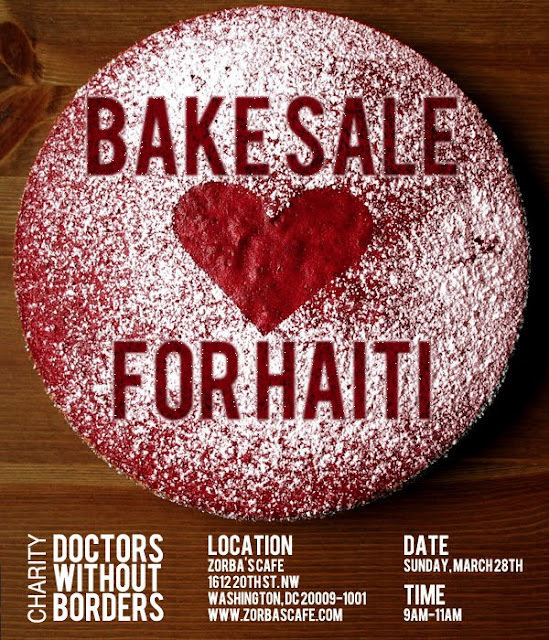 Unfortunately, I would not be able to participate in this, but if you are in DC area on Sunday morning, March 28th, please buy some great baked goods and help raise money for Haiti. "DC Food Bloggers are at it again! Making bake sales cool again, a group of DC area food bloggers have gotten together to whip up some tasty treats for a great cause. This time the bake sale will be on the patio at Zorba’s Cafe (big, big thank you for their support) on Sunday, March 28th from 9 am to 11 am! All the proceeds from this bake sale will go towards Doctors Without Borders’ relief efforts in Haiti. Please, please, please come out before hitting up the Dupont Circle Farmers Market and buy some goodies! We’d love to sell out this bake sale too! And if you would like to volunteer to help (we need bakers, we need sellers, we need set up and clean up help! ), drop me an email! And feel free to gank the above flyer (made by Thrifty DC Cook’s awesome cousin Thomas) to pimp out the bake sale on your blog, website, office bathroom door, etc. Oh yeah, it’s shameless promotion time…but it’s all for a good cause!" Remember my dinner at Tallula? How about my lunch at Bourbon Steak? Both dining experiences were a result of being invited to test out new menus by Sangeetha and Amber of Pfau Communications. 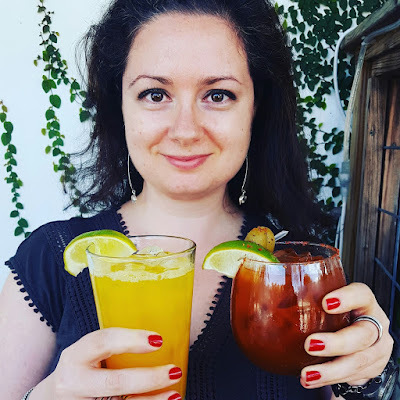 And so when last month Sangeetha emailed me to see if I'd be interested in joining her and a few other DC food bloggers to try a new brunch menu at Birch & Barley, my response was YES! This was my first time at Birch & Barley, although I've heard a lot of positive chat about this stylishly modern restaurant from area food lovers and food critics. Despite having less than 6 hours of sleep, and having to deal with a cold rainy Sunday morning, I was looking forward to brunch-ing with Sangeetha, Adventures in Shaw, The Arugula Files, Capital Spice and Brunch and the City. The brunch menu fit on one page, which is a good thing for someone like me, who doesn't like to be overwhelmed with too many options early in the morning (or ever). The dishes included favorites like fried chicken and waffles, omelets, and French Toast, but also had a few surprises: Italian sausage flatbread, Truffled Croque Madame, and Corned Beef Hash. Oh which one to choose? Before making our choices, we ordered a pitcher of Brunch Punch (Chamomile tea, orange juice, triple sec, old overhold rye whiskey): and what a punch it had! I was happy I did not have to perform any important tasks later on the day, because the punch went straight to my head. Another awesome thing about eating out with Sangeetha is that she always "makes us" order a few things to share on top of our individual choices. This time, we started with dessert: sticky buns and freshly fried donuts. The donut trio included a cinnamon-sugar donut, a chocolate glazed donut, and a lemon poppy seed donut. The last one was my favorite: the amount of lemon flavor that hit you with each bite was refreshing, surprising and had you asking for more. Oh, and I'm not nearly done! Check out this photo I took of all the food we ordered. Does this look like a medieval painting, or what? For my entree, I ordered Corned Beef Hash with Fried Duck Eggs and Parsley. This was my first time trying duck eggs, and I was not disappointed. The yolks were rich in both the yellow color and the buttery flavor. And I was happy to taste the perfectly cooked through potatoes (one of my biggest pet peeves is when breakfast potatoes are under-cooked). And if the amount of beef on my plate wasn't enough, I also had a few strips of bacon (you can see it better on the photograph above). Chicken Flatbread, etc, etc, etc. Needless to say, there was a lot of good food to go around, and we did our best to finish as much of it as could possibly fit into our stomachs. But we could not finish it all. This by far is one of the best ways to spend a Sunday morning: strong coffee, strong punch, delicious/innovative/unpretentious food and entertaining company. At least four of us had the same Canon Rebel SLR cameras: you should have seen us trying to outdo each other in the photo-taking tasks (Sangeetha promised that the best photo will win a prize....I'm on pins and needles). Move over oatmeal! It's quinoa's time to shine as breakfast food. Sometimes I can't be bothered to plan for breakfast. Don't get me wrong, I never skip breakfast, but sometimes it's just an after thought. You see, I'm not a huge fan of cereal with milk, or oatmeal, or granola bars. In fact, I'd rather have something savory for breakfast such as bagels with cream cheese and lox, hummus or even chips and salsa. Yesterday I took a day off work because whatever "bug" my body has been having for the last week hasn't entirely gone away. I opted for a day of couch sitting and TV watching. This, however, was also a great opportunity to make something that would last me a few days for breakfast. In comes quinoa! Yes, move over oatmeal: it's quinoa's time to shine as breakfast food. 1. Rinse quinoa in a fine strainer. Add to a pot with water and dry milk. Bring to a boil, reduce heat, cover and simmer for 15 minutes or until the grain is cooked through. 2. Combine quinoa with the rest of the ingredients. You can serve this dish hot or cold. Add a bit of sugar if you like your breakfast on a sweeter side. Try to experiment with different dried fruit! What are you eating for breakfast these days? Once again, I was happy not to be intimidated by this challenge since I've made risotto a few times in the past and did not find the task too complicated. We also had to make broth from scratching. The recipe I came up with is one of those "clean out the refrigerator" recipes. 1. Add all ingredients to a pot. Bring to a boil. Lower the heat, cover and simmer for 45 min. Strain. Now to the risotto part: if you want a full recipe, let me know. I made two changes to the original recipe: using Cheddar cheese instead of Parmesan and using red onions instead of regular ones. Note: my SLR camera told me to charge my battery as soon as I started working on this post. Thus, the photographs you see here were shot with my point/shoot camera. Ugh, the difference is huge. 1. In oil cook chopped red onions. 2. Add aborio rice and cook for a few minutes, making sure each grain is coated with oil. 3. Add a bit of wine, and cook until it evaporates. In several batches, add the broth, making sure it is cooked off before adding more. 4. Once the rice is cooked through, add the toppings: I added a cup of defrosted peas and roasted red and yellow peppers. How do you roast peppers? Find out here. 5. Next, add cheese, let it melt. Let the mixture sit for a few minutes before serving. I was pretty happy with how this came out! What do you like to add to your risotto?